And in any case there are no supernatural sounds nowadays. 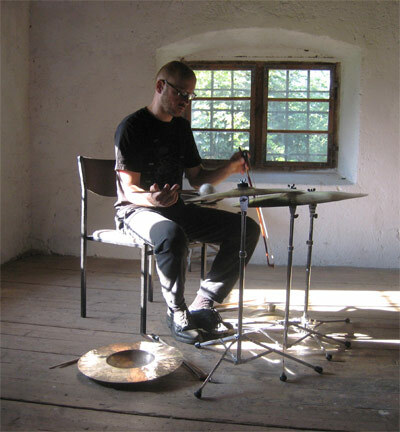 Christian Wolfarth sensed the potential for drums and cymbals to be sounded in ways that can confound the ear without a trace of gimmick or schtick at least as far back as 20 years ago, when he released his first solo outing 3-3-2: Eight Pieces For Drums. At that time Wolfarth was in the thick of four years of percussion studies with the brilliant Pierre Favre at the Conservatorium at Luzern; Favre had released his own solo work in 1972, with the ironic title Drum Conversation. Seeds are sown, obsessions are born (in both senses), and Wolfarth continues to sound his drums and cymbals, releasing works bearing bare bones titles like Acoustic Solo Percussion, Volumes 1-4, and, for your consideration here, Scheer. There is nothing bare bones about the sound worlds unlocked and loosed across the considerable arc spanning that inaugural release in 1994, developed through 2005’s Wolfarth (For 4 Ears), and culminating in the Acoustic Solo series cited above (released on 7′ vinyl), and now, Scheer. The ASP volumes offer brief studies averaging only 4-7 minutes per side, and could not subvert your expectations a jot more. Wolfarth has, for as long as he has been a percussionist, chosen not to augment or extend his materials electronically. At the same time he has, it seems to me, decided to not limit himself to sounding exclusively acoustic. This positions him in an area of the percussion firmament in which a handful of composer-musicians practice wresting, wringing and prizing the most improbable sounds from the most barest of kits, creating full-blown works, richly-realized works, supernatural sounds. Wolfarth has some kinship with percussionists like Jason Kahn, Greg Stuart, Ingar Zach, Burkhard Beins, Jeph Jerman, and Nick Hennies. I am not listing my favorite percussionists who make cool sounds; I am pointing to some of Wolfarth’s contemporaries who, with often widely divergent sonic results, practice a radically stripped-down path to a yield of impossible sounds, which are then shaped into sturdy, often stunning works. Scheer’ s two tracks move through a considerable scope of possible sounds, in Wolfarth’s characteristically concise fashion. He doesn’t waste a sound, or a minute – Scheer might initially be engaging on that how the hell is this only cymbals ? level, but that’s the typical state of stretched credulity you initially experience in his solo work. With repeated soakings you hear the superb control of dynamics, a hyper-focus, like that in Radigue’s work, that is moving rather than dry or studied, and cymbals like you’ve likely never heard them before – at times so liquid and amber-y that incredulity returns – how is this metal alloys excited by any means? This entry was posted in music writing on November 11, 2014 by jessewgoin.